Bett's Spin Split Tail's are hand poured and custom decorated. They feature gold hooks, high quality spinners, and original style head with barb to hold lure on hook with large painted eyes. 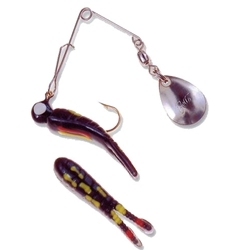 These Split tail spinners come with one pre-rigged bait and 2 extra bodies. Quantity Size 1/8oz 2" 1/4oz 3"